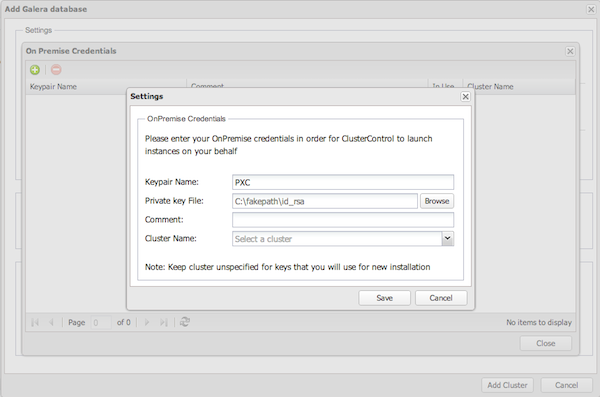 In my last blog post I explained how to use Percona ClusterControl to create a new Percona XtraDB Cluster from scratch. That’s a good option when you want to create a testing environment in just some mouse clicks. In this case I’m going to show you how to add your existing cluster to Percona ClusterControl so you can manage and monitor it on the web interface. The environment will be pretty similar, we will have UI, CMON and 3 XtraDB Cluster nodes. The cluster should be already running and Percona ClusterControl also installed. The ClusterControl web interface is empty, there are no clusters on it. To add an existing one we need to click on “Add existing Galera Cluster.” (Click on the image for an enlarged view). In the second part we have the SSH configuration. There is one pre-requisite, the UI server should be able to connect to all servers using a SSH key. Therefore, our first step is to create a SSH key pair in our UI server and copy the public one to all other servers. As we can see here, everything works as expected and all servers are reachable by SSH. The parameter “Create shared SSH key” also needs to be enabled. That option will make ClusterControl to create a new SSH key pair on CMON node so this one can also connect to PXC nodes with passwordless SSH. Now we can monitor it, get alerts, clone, run backups and everything from the web interface. You can also add multiple clusters and create new ones.